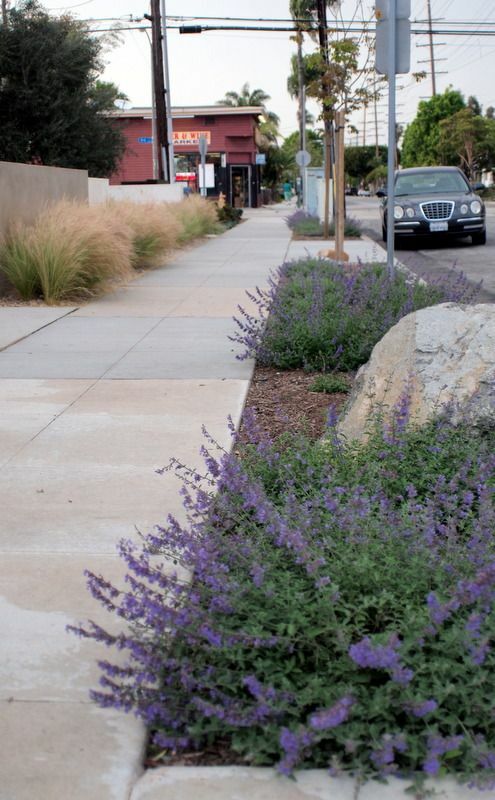 Lawns are vanishing all over town. 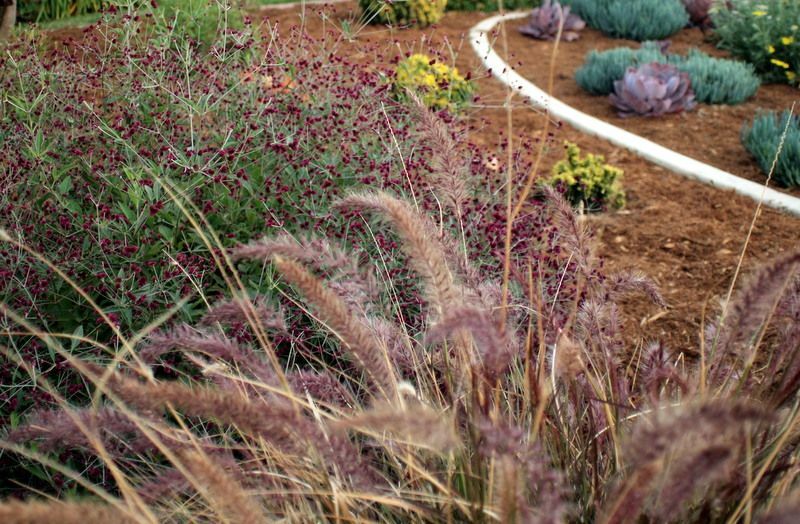 The chief ringleader and instigator is the Long Beach Water Department, with their irresistible Lawn-to-Garden Turf Replacement Program. Quite a few of my neighbors have already taken advantage of this program the past couple years, and more applications for the $3K rebate are being accepted now. 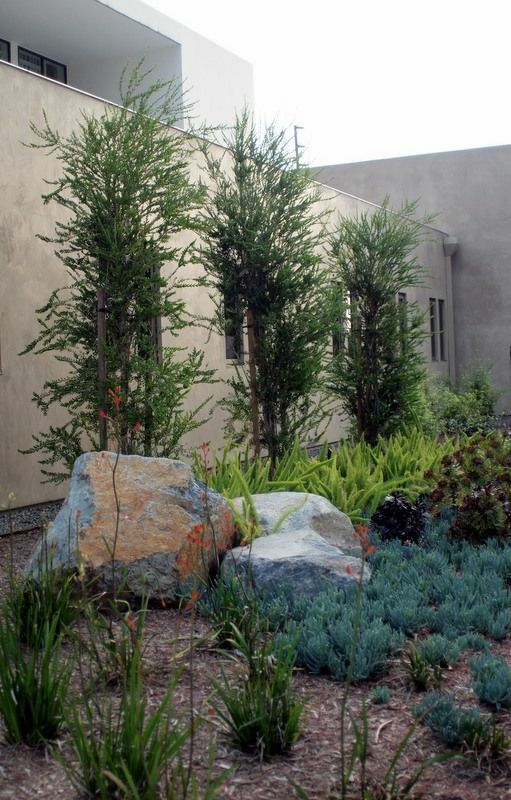 There will be an upcoming tour May 18 to showcase some of the gardens that have taken up LBWD’s offer. Last evening I snuck a driveby look at one of the houses on the tour. Close to the house, behind the potted orange tree is a tall, diaphonous Pittosporum tenuifolium. In back of the Tibouchina urvilleana, center, is an olive tree. 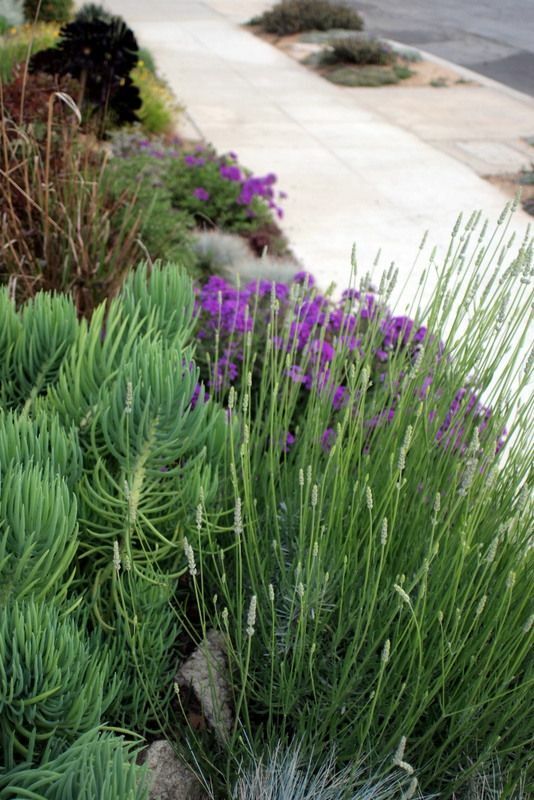 Blue Chalk Fingers, Senecio vitalis, Festuca glauca, lavender, and a glimpse of Verbena ‘Homestead Purple.’ There were Iceberg roses, gaillardia, aeonium, daylilies — lots of blooms to come for summer. Lots to interest people, birds, insects. The parkway has been deturfed too. When lawn is removed the fun begins, and these garden makers really seem to be enjoying themselves. I’m guessing this little bulb is a babiana. (Dustin Gimbel confirmed in a comment Triteleia ‘Ruby’). This lawn is being nibbled away at the margins, but I’m predicting it won’t be long before it vanishes completely too. 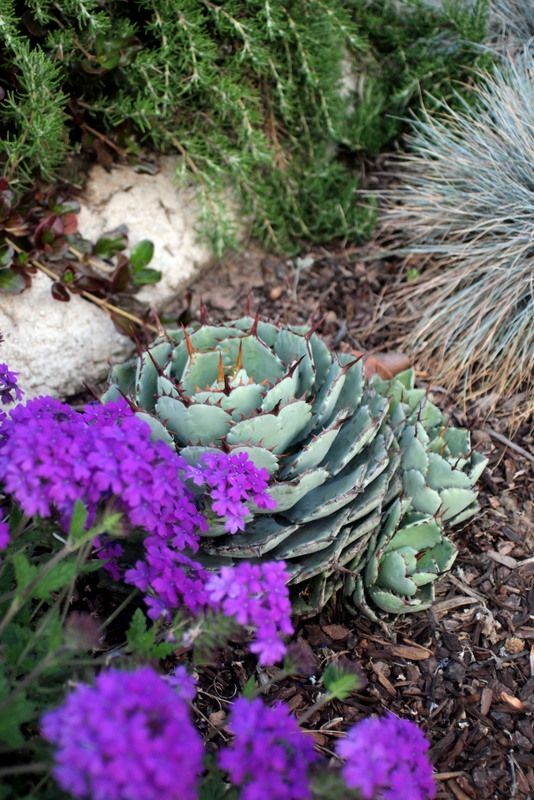 Agave potatorum nestled up against verbena. 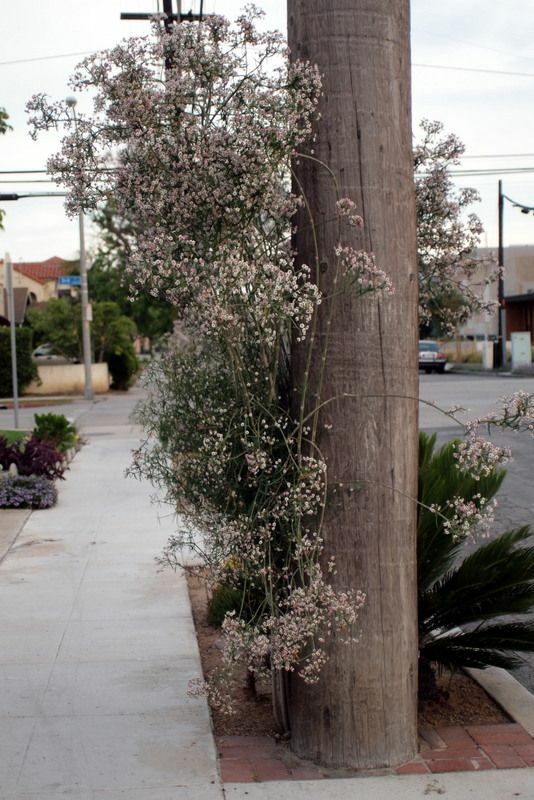 Try to imagine it not squished against a telephone pole. There were three of these euphorbias in the parkway, one around the corner. 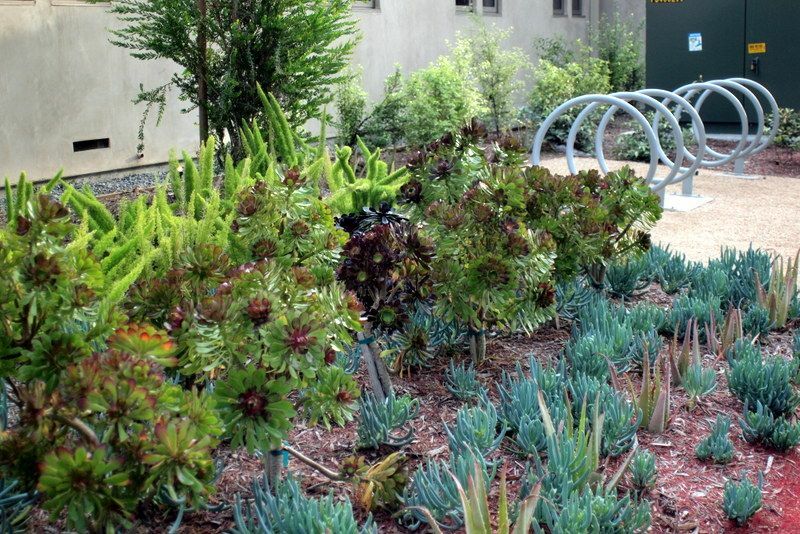 An interesting contrast to these personal gardens lies diagonal across the street from them. Just four months ago, architects Abramson Teiger finished a major renovation of the Temple Israel, including the landscape. Long sweeps of feather grass, a problematic self-sower, and nepeta anchor the front of the temple. 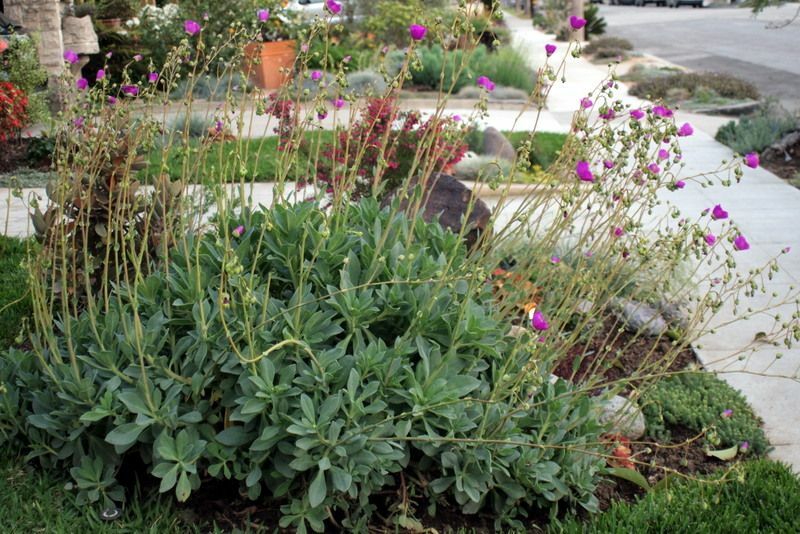 With the prominence succulents continue to enjoy for their evergreen, year-round good looks, it’s unusual for new landscaping projects to include perennials, even evergreen shrubby ones like Verbena lilacina, a California native. I love the needlepoint detail against the concrete work and their billowing effect. 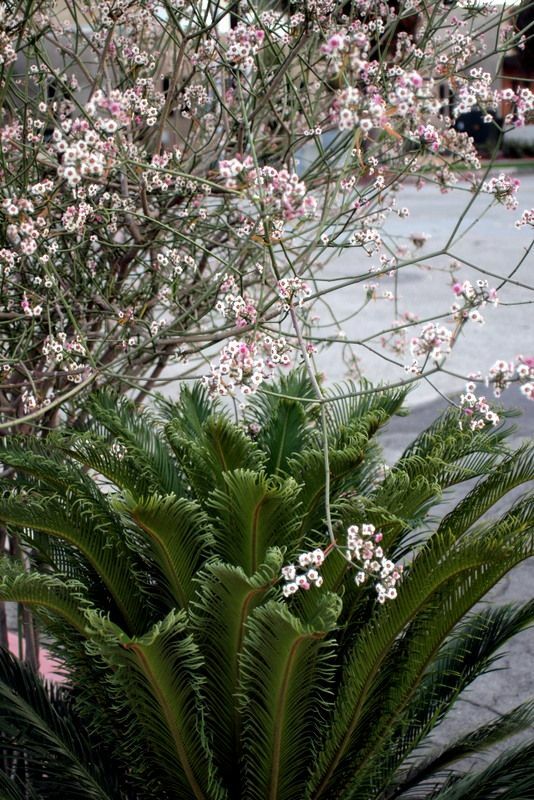 Despite their many attractions, billow is one verb that can’t be used with succulents. 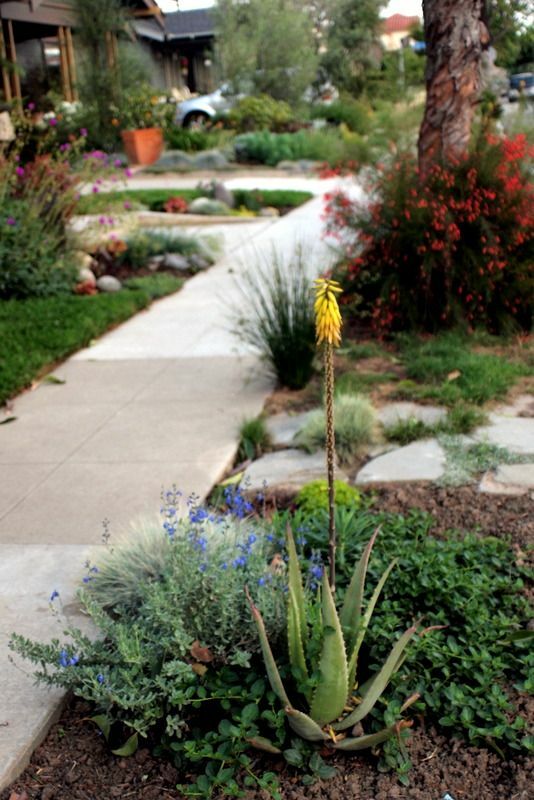 Though succulents are included here too: Senecio mandraliscae, aloes, aeonium. Meyer’s asparagus fern in the back. What looks like red-dyed mulch are fallen petals from the callistemon bottlebrush trees overhead in the parkway. Anigozanthos, the kangaroo paws, in the foreground. I couldn’t get close enough to these trees for an ID, but they had an Australian look to them. In the fading light, against the building can just be seen the slim outline of more anigozanthos, the shrubby Teucrium azureum to the left. 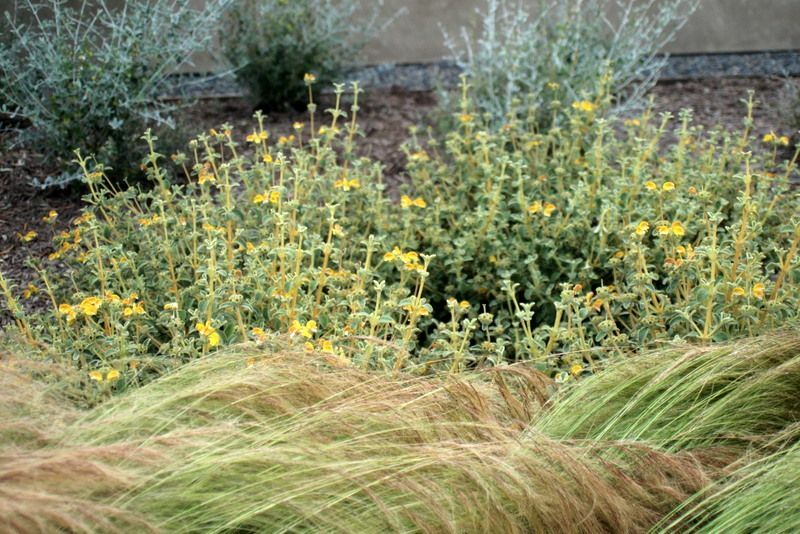 Feather grass, phlomis, with Teucrium azureum in the rear. 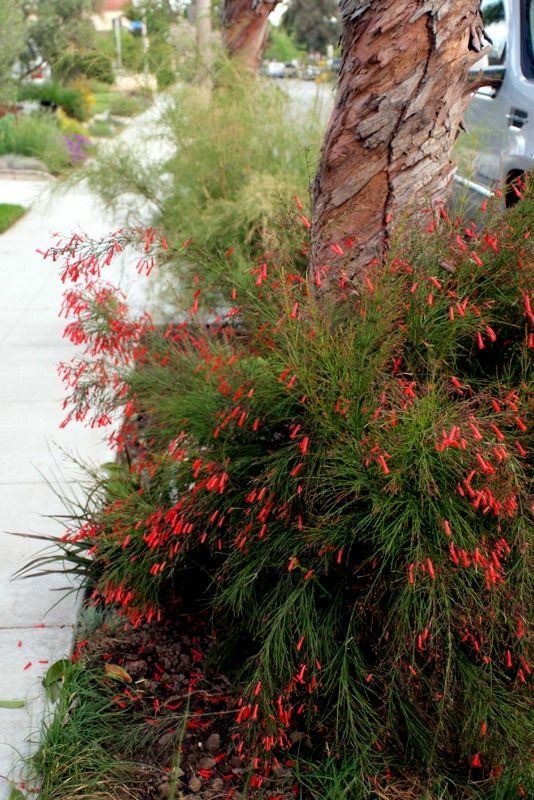 All these plants are as drought tolerant as succulents, though their upkeep and cutback needs differ. 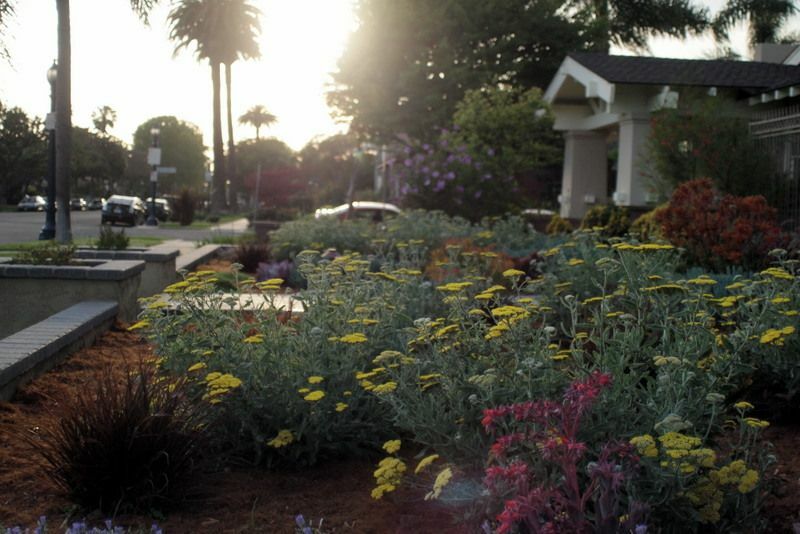 A few streets away, a front lawn has been usurped by Achillea ‘Moonshine.’ All over town, whether commercial projects or residential, the hissing of summer lawns during the hot, dry days of summer is becoming a relic of the past. 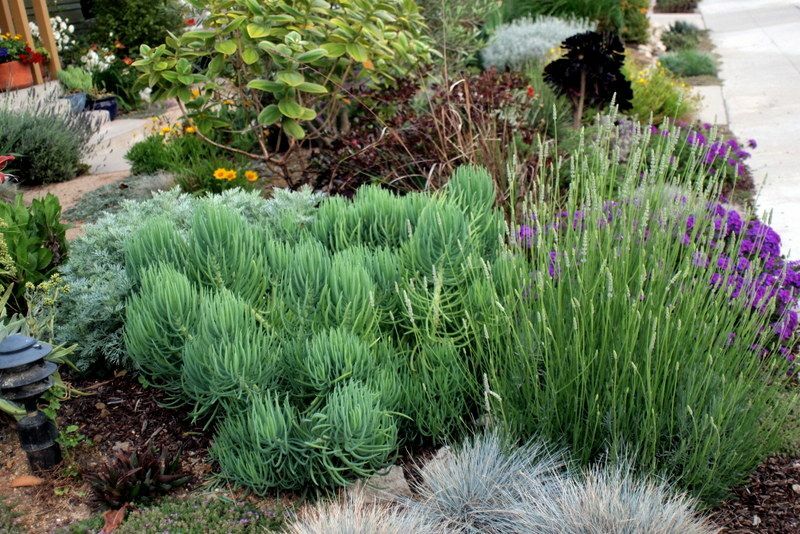 And another lawn vanishes under succulents, pennisetum, and a cloud of Gomphrena decumbens. 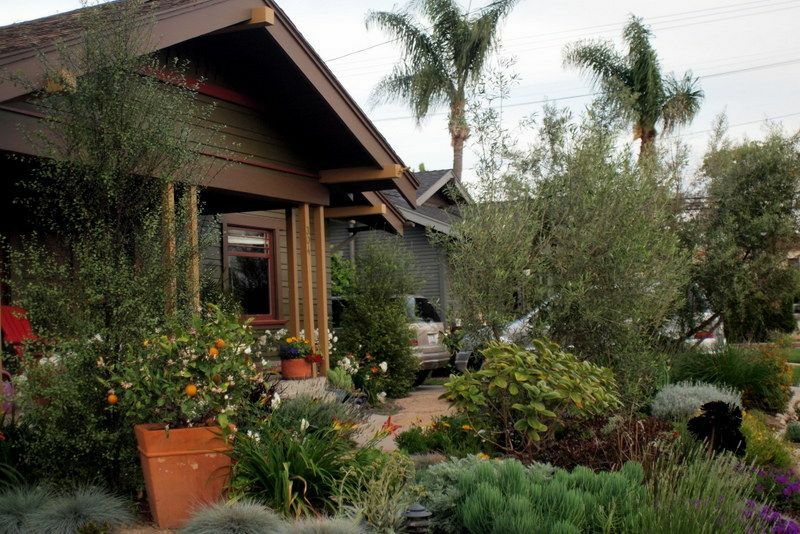 This entry was posted in climate, design, driveby gardens, pots and containers, succulents and tagged Achillea "Moonshine', Anigozanthos, architects Abramsom Teiger, Baja spurge, Calandrinia spectabilis, California, Euphorbia xanti, Gomphrena decumbens, Joni Mitchell's Hissing of Summer Lawns, Lawn-to-Garden garden tour 2013, Lawn-to-Garden Turf Replacement Program, Long Beach, Long Beach Water Department, mediterranean climate, nepeta, Pittosporum tenuifolium, Russelia equisetiformis, Salvia chamaedryoides, Senecio mandraliscae, Senecio vitalis, Stipa tenuissima, Teucrium azureum, Verbena 'Homestead Purple', Verbena lilacina. Bookmark the permalink. So much better than lawn! I wish Portland had a similar program, it would be amazing to incentivize people to rip up lawns and plant gardens! 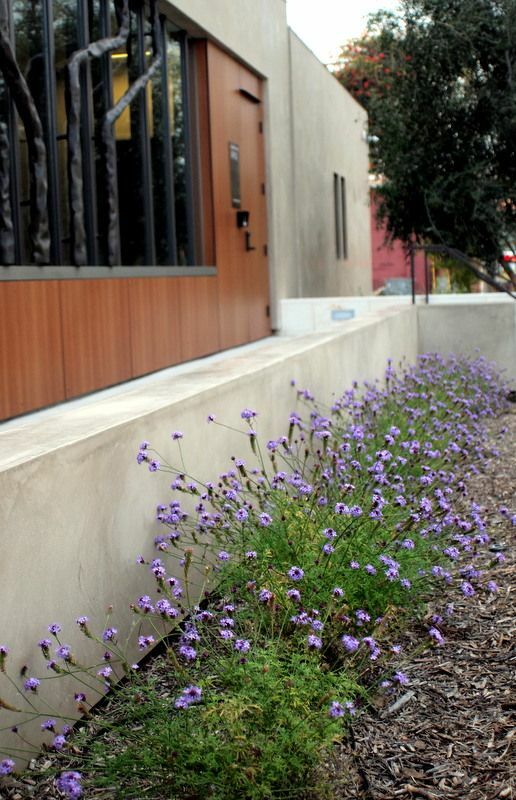 LOVE the Verbena lilacina, but it hates me…maybe I’ll try it again this year. Also, thanks for reminding me of Gomphrena decumbens…I finally remembered to put it on my Annie’s wishlist! 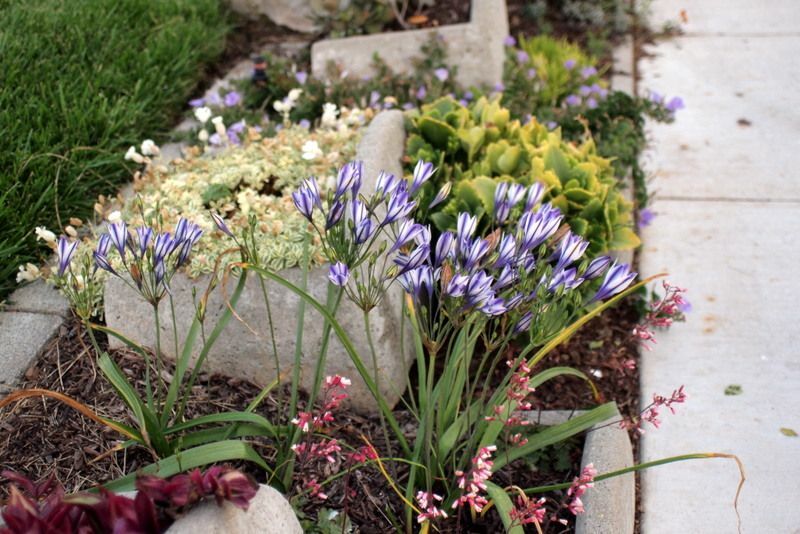 Great examples — so much prettier than lawn, and water-saving to boot. 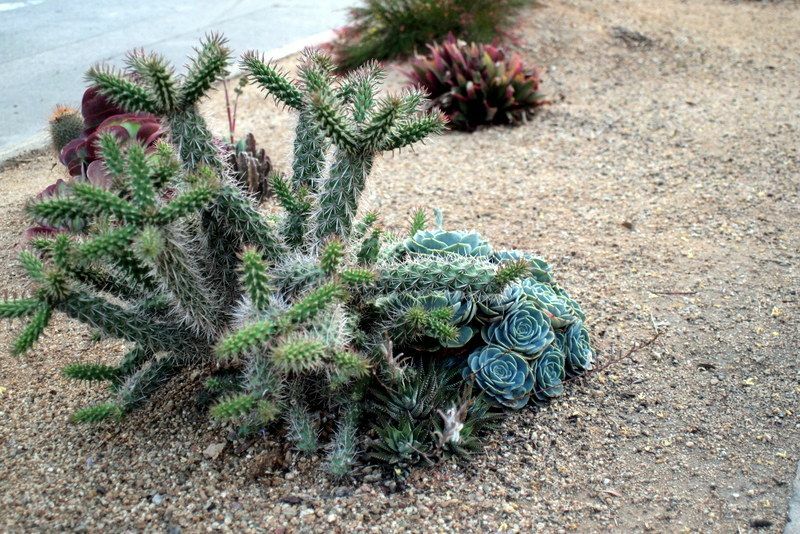 Nice plant combinations. Would love to grow some of them in Kansas. I have removed 40% of my turfgrass, more to go. Beautiful. Hopefully it will encourage bees and other pollinating insects, they have had a hard time recently. And. The ‘moonshine’ garden was my idea. 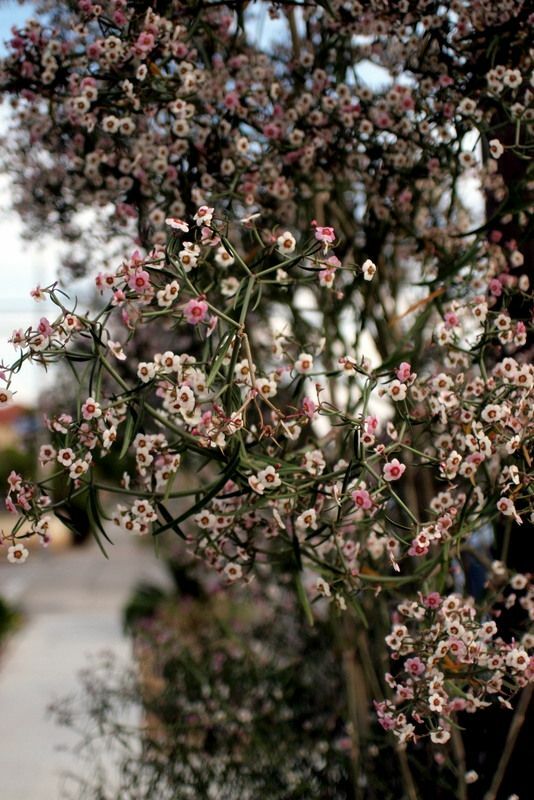 That guy wanted a designer but wouldn’t listen, though he did listen to me about the yarrow. He did take out a pool which is laudable. @Scott, I was surprised to find this program still chugging along. And I really need to find a spot for that verbena too. 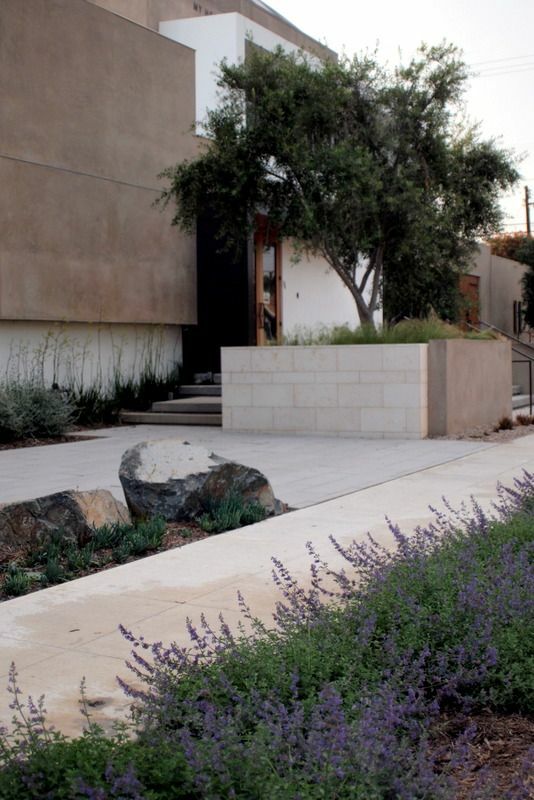 @Pam, amazing what creativity is unleashed when a lawn is no longer considered a necessity. @Greggo, I’d love to grow a lot of what you Kansans grow! @Helena, so true, all pollinators welcome. I’m just finding out how many bee species, and tiny ones! there are besides the honeybee. @Dustin, duly noted and corrected. I got a little too close to that Moonshine garden’s front gate, and the speaker was activated, a voice inquired what I was up to, so I gushed about his garden, apologized, and got the hell out of there. That is so neat! One of the things that drives me nuts is the American love affair with lawns. Having lived in the UK for six years, I got so used to every house (even sometimes in dubious council estates) having gardens. Here we have crabgrass city. I am slowly shrinking an estate’s sprawling lawns, so that the carefully mown sections are paths and accents, much more interesting that monocultures. I am a member of this club, but there are not many joiners here. However, irrigating lawns is not the norm here, and rarely do we have water restrictions, maybe twice in the past 20 years. On visits to Denver I noticed many lawn-free gardens in the city, but I am not sure they have a formal program or not. They probably do as Colorado is the home of water management. I’m happy to see this program is doing well and that people are creating such beautiful landscapes. I hope this sort of program catches on elsewhere–it’s wonderful. I wish we had a similar movement here in the Sacramento area. In spite of occasional efforts to replace the ubiquitous front lawn, we’re still wasting too much water on grass. I’m a guilty party, too, although our front lawn is tiny compared to most (and the sprinklers provide water to more than just turf grass).